When Miss Bates rediscovered romance and dipped into various authors to determine who would suit for long-term relationships, she resolved to read certain authors’ oeuvres because she enjoyed, appreciated, or found the initial sampling thought-provoking . One of those was Carla Kelly; this reading comes of Miss Bates’s reach into the back-list. Summer Campaign did not disappoint. After a slow start, Summer Campaign was wonderful and had the rare honour of turning Miss Bates into a watering-pot on several counts. What is it about Kelly’s stories that Miss Bates finds poignant, slow in places and imperfect, but moving and loveable? 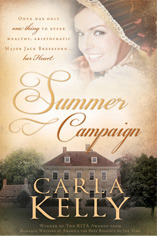 In the case of Summer Campaign, it lies in Kelly’s use of a military metaphor to tell a story about laying a siege of the heart. If you are vulnerable to her writing and the type of stories she tells, Kelly’s novels besiege the reader’s heart, tear down the walls, and expose vulnerable centres all the while reminding us that the purposeful life is a life of service conducted with humour, strength, and good will. Like an effective military maneuver, this early Kelly regency deceives the reader into thinking it a gentle, farcical romance. There are hints of darkness; initially, we remain blithely ignorant of what awaits. The reader settles in, feet up, tea cup in hand, self-satisfied smile … supplies plentiful and emotional defenses dormant. The horror creeps in “on little cat feet, ” as the poet says. When Major Jack Beresford and Miss Onyx Hamilton meet in the English countryside, they are the walking wounded returning from war: in Jack’s case, from the Spanish campaign against Napoleon and Badajoz horror; Onyx, after waging domestic war against her mean-spirited step-father and mother (since the death of her beloved adoptive father, her step-mother’s first husband.) Their lives are yet in a “fog of war:” their wounds invisible, rifts in their personalities running deep. Jack and Onyx are strong and have developped coping mechanisms. They meet in the midst of a pickle that requires fast thinking and acting: Jack comes upon an Onyx about to be raped by a gang of thieves. She’d been on her way to marry the Reverend Andrew Littletree, a man so pompous and obsequious he makes Austen’s Mr. Collins look dignified, generous, and kind! Like Austen, Kelly is good at subtly, penetratingly showing these every-day cruelties. Jack is on his way home where his dying brother, Adrian, and sister-in-law, Emily, await him. All is on hold when Jack is injured in the melee and Onyx must care for him at a nearby farm and later at Lady Bagshott’s, a seemingly Catherine-de-Burgh-type character who proves to be kinder and more astute than she first appears. She is, as CdB is in Pride and Prejudice, the Reverend Littletree’s patroness. One of the things Miss Bates loves about Kelly’s work is that she doesn’t mince words about the world’s cruelties, dangers, and difficulties: the ravages of war, sickness, the unkind gesture, oppression, all the ills, natural and human, that “flesh is heir to.” Onyx and Jack have suffered from what life has dealt them. Kelly cleverly opens her book with the notion of home, “I just want to go home,” says Jack; he yearns for the peace of ordinary English country life. Jack suffers from PTSD; he stutters and has nightmares. He is haunted by memories of the war’s bloodiest battles, especially the bloodbath that was Badajoz. If Miss Bates loved Onyx, boy-oh-boy, how she adored Jack Beresford and his patient, kind, loving nature, his honesty, bravery, humour, and wisdom. And, he weeps! Convincingly, well, and on three different occasions for reasons that are difficult, dark, and deep. He and his “summer campaign” to win Onyx’s hand made the book for Miss Bates. He is a brilliant strategist, using military tactics to besiege Onyx’s heart, showing her, not forcing or telling, the way to acknowledging her self-worth. He knows when to attack, when to retreat, and when to wait it out. There’s brawn in our Jack, but he never struts his stuff, manhandles, diminishes, or controls. He wins her with a wink, impressive emotional salvos, and love that puts the other before self. He even has the good manners to warn Onyx that he’s coming for her heart; as he says to her, “I’m a great campaigner.” Wink. After all that Jack has seen and done in war, what does he care about Onyx’s illegitimacy in light of her kindness, humour, helpfulness, wit, and beautifully ample bosom … the man’s not made of stone and charmingly so! But, Onyx cares. She will not accept Jack’s proposal, not allow him to marry a “non-entity,” as she calls herself and become a social pariah … yes, Jack is also wealthy and blue-blooded. He doesn’t dismiss her misgivings. He tells her he loves her, but respects her too much to use his position and privilege to force her hand. Jack does something subtle and interesting. He retreats, returns home. There, he sets out on his campaign to woo her by first writing a letter. Though this is not an epistolary romance, the letter is key to the romance. The letter is very simple and does not try to change her mind; instead, he asks her help nursing his dying brother, not because she’s a convenient-nurse-Cinderella, but because she’s the best person he knows for the job and he needs her. He appeals to the BEST in Onyx: who can resist such a call? I need you; no one else will do; there is work to be done; only you can do this … because you are unique and important. Jack as hero-suitor-strategist wins the battle and is well-entrenched to win the war. Onyx hastily arrives at his doorstep and stays to care for Adrian, whereby Jack and his family make her feel important, useful, and loved. Like Jane at Thornfield, Onyx blossoms because she is not “trampled on … petrified … buried with inferior minds … excluded from … what is bright and energetic and high” (Brontë, not Kelly). It is a unique romance when two people fall deeper and deeper in love nursing a dying man, dealing with his grief-stricken, helpless wife, running a household and estate, experiencing pain and joy intermingled. Yet, it only takes one petty reminder of Onyx’s illegitimacy to send her flying from Jack. Again, Jack doesn’t insist, or give chase; he waits and hopes. In an inspirational romance (and this one comes close to being one in Miss Bates’s estimation, but that’s for another post), he would pray. Jack waits and hopes that his campaign will bring victory, that the seeds he has planted in Onyx will bear fruit. But the decision must be hers and hers alone; as Jack says to her, “I would do anything for you, but the only person who can convince you of your own worth is Onyx Hamilton.” Kelly’s pen, like Austen’s, can illuminate “guilt and misery:” battles are lost all the time, but the HEA of our hero and heroine wins the war in hope, love, and charity. Miss Bates purchased an e-copy of Kelly’s early novel and you can too in the usual places. It was originally published by Signet in 1989 and re-issued by Sweetwater Books in 2012. Thank you for this excellent review. I have read a goodly number of Ms Kelly’s books and have enjoyed almost all of them I had been dithering about this one, but no longer! Just added it to my electronic TBR. You are most welcome! Thank you for your commentary :)! I liked Summer Campaign better than I expected to. Though I’ve enjoyed every Kelly book I’ve ever read, I consistently have found her style precious when I start a book. I have the same reaction to Nora Roberts and Mary Balogh, not about style necessarily, something off-putting about them; but every time, I read one of their books, I do like/love it by the end. Kelly is the only one who reduces this hard-hearted spinster to tears though! I have downloaded your two suggested titles already and, with them, brought my Kelly TBR pile to ten titles! Thank you for setting my dithering right! I think you’ll enjoy Summer Campaign, despite its slow start and weirdly-named heroine, Onyx. I won’t say much more, but the revelation of Onyx’s parentage is unnecessary too. Wishing you a happy-filled day and wonderful, engrossing reading!